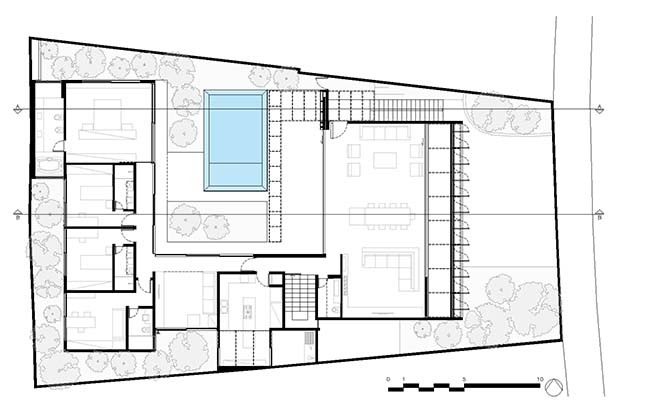 From the architect: Thus, on the ground floor we have lodged garage, storehouses, technical facilities, part of services, servants’ quarters with pantry, and accesses through internal and external staircases. 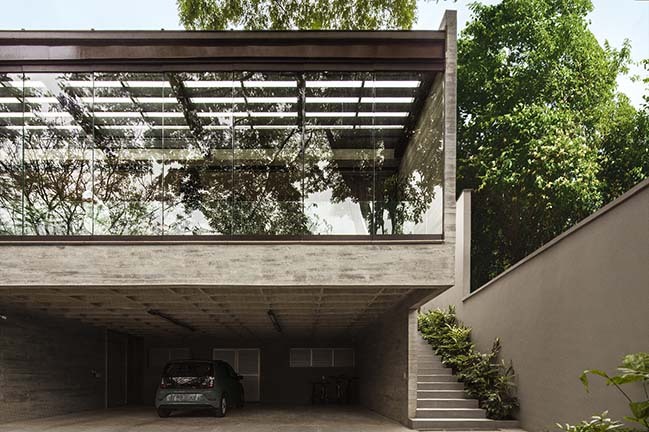 The upper floor has been installed on the highest part of the existing slope and cantilevers over the ground floor, which is just above street level. 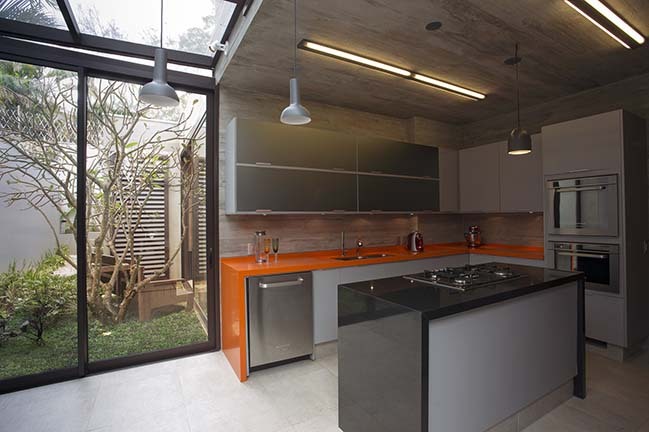 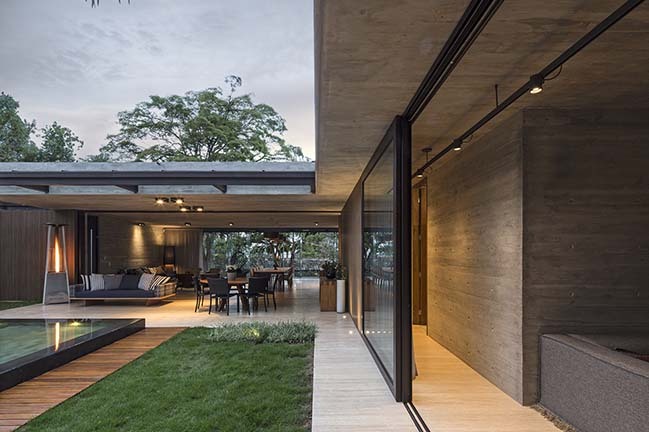 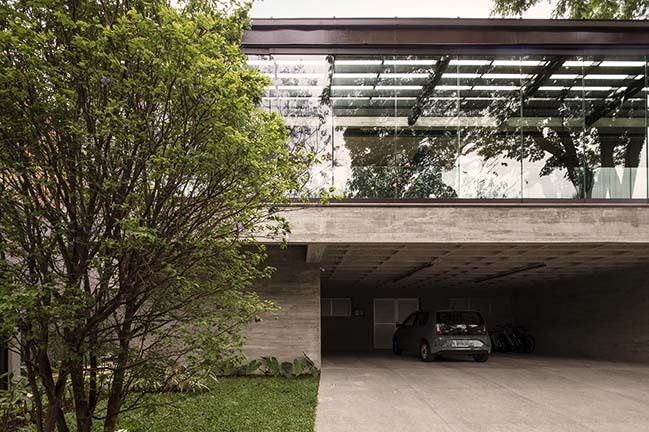 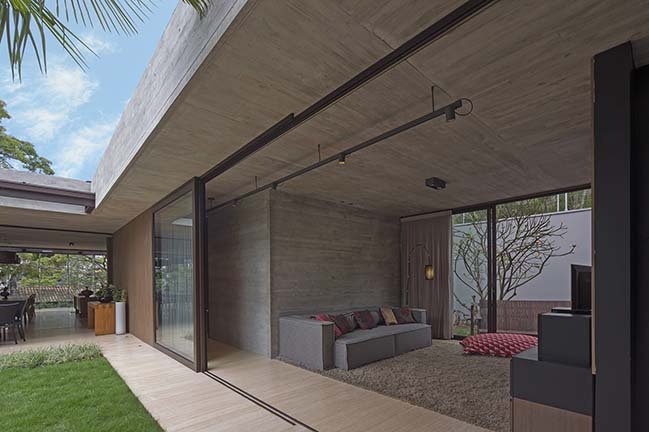 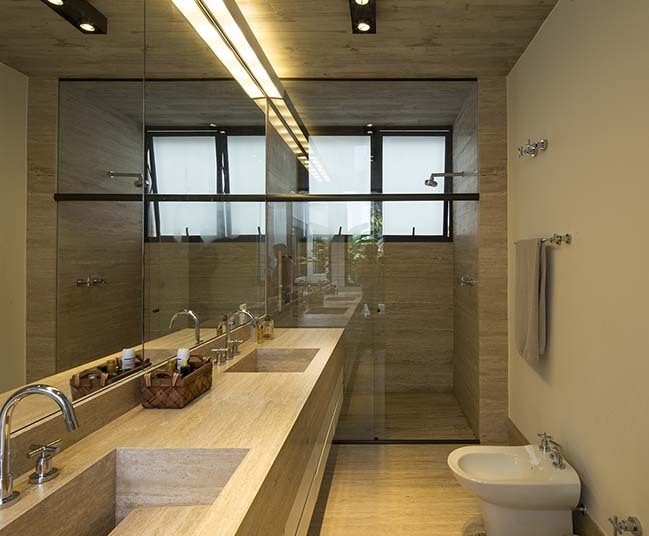 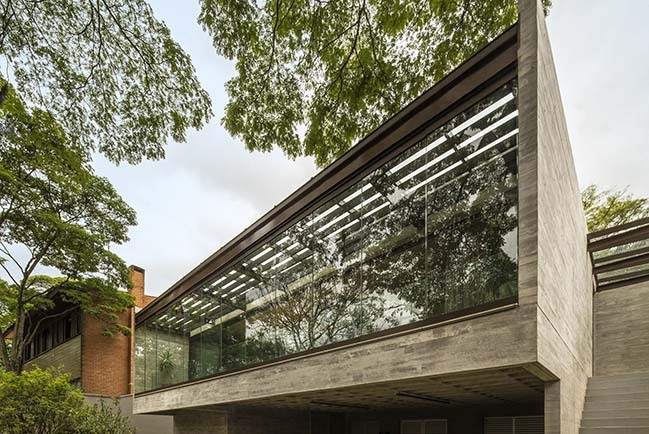 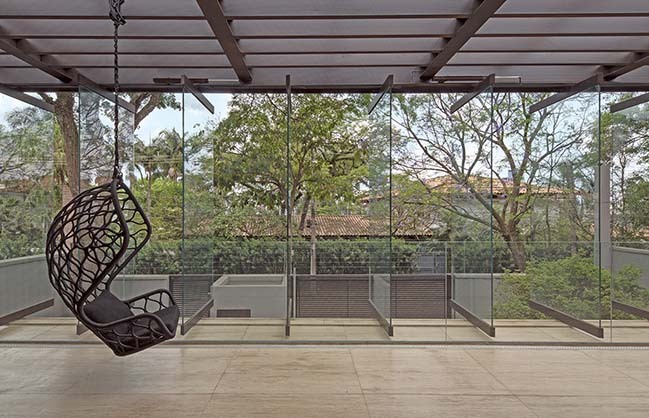 On the upper floor, the program was organized around a central courtyard, whose U-shape plan is articulated by a circulation, with powder room, internal staircase, kitchen and pantry, an intimate room, and by two wings parallel to the external road. 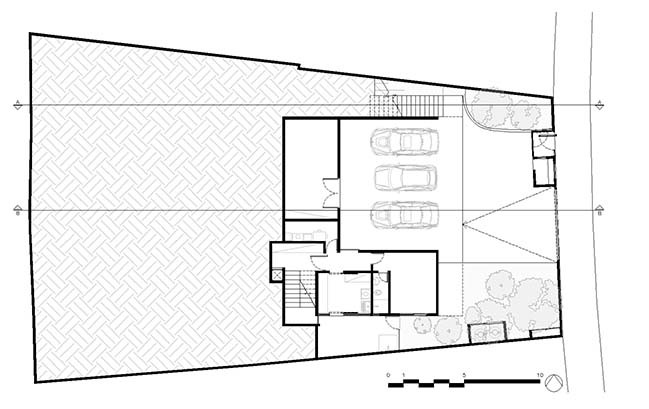 The wing closer to the street houses a great lounge with living and dining areas, home theater and balconies. 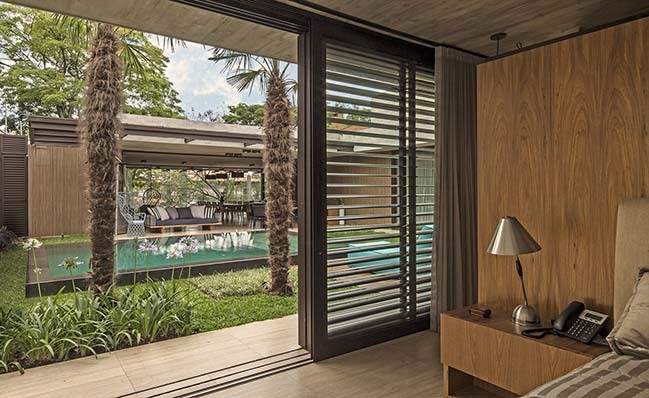 In the back wing we have a sequence of four suites, the last being a master suite. 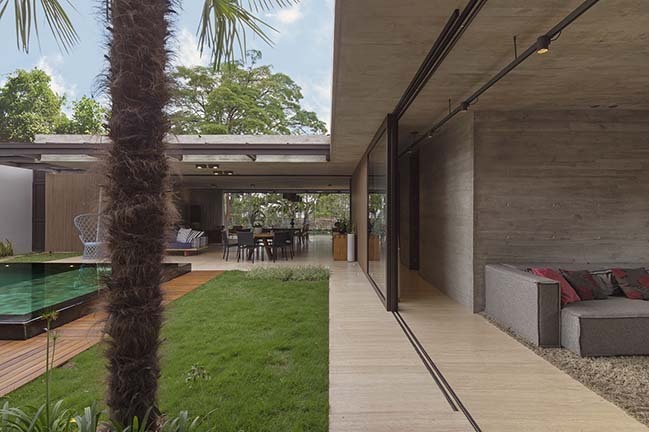 The construction, of exposed reinforced concrete cast by wood slats, has components in outstanding materials such as steel, wood and glass. 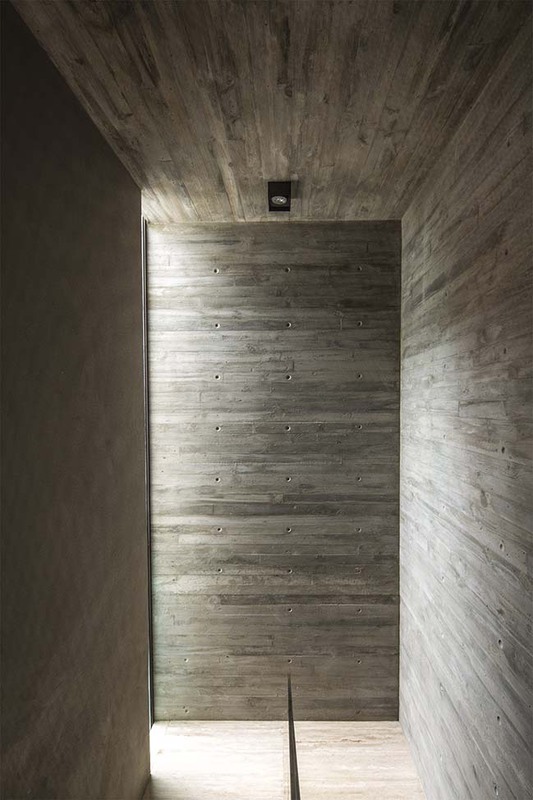 The floor, of levigate travertine Roman marble in the internal ambiances was also used in the external area, and the absence of unevenness has enhanced the continuity between exterior and interior (there is a system of rainwater capture built into the stones). 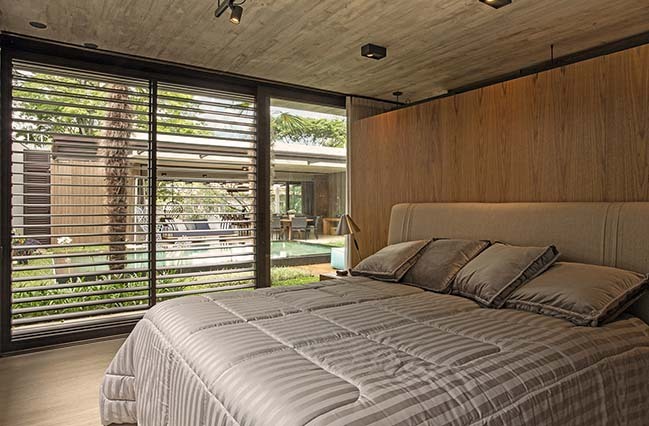 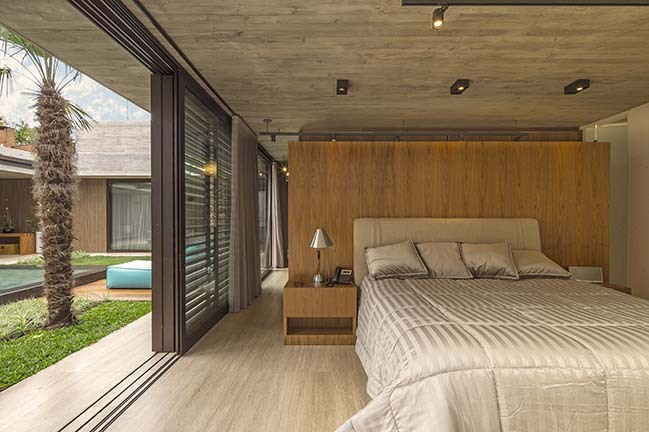 One of the design highlights are the brises of the master suite, which function either as sunshades (modulating the entrance of light until total closure), or as opening doors. 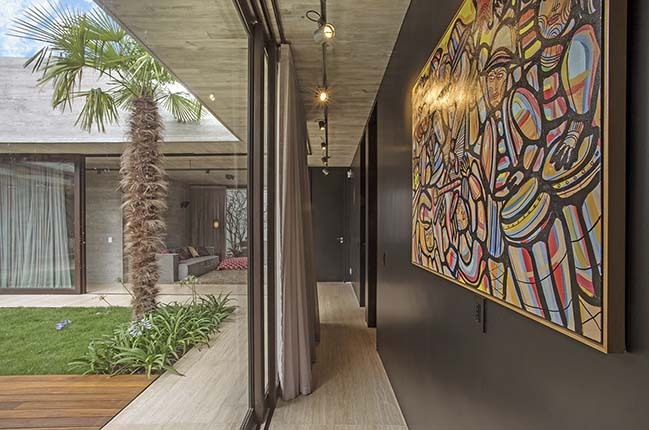 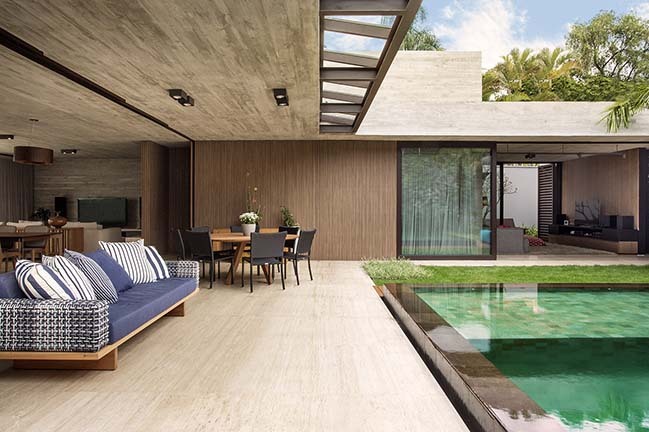 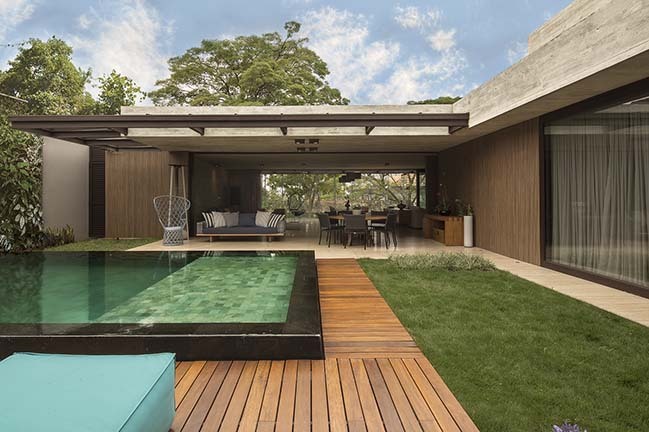 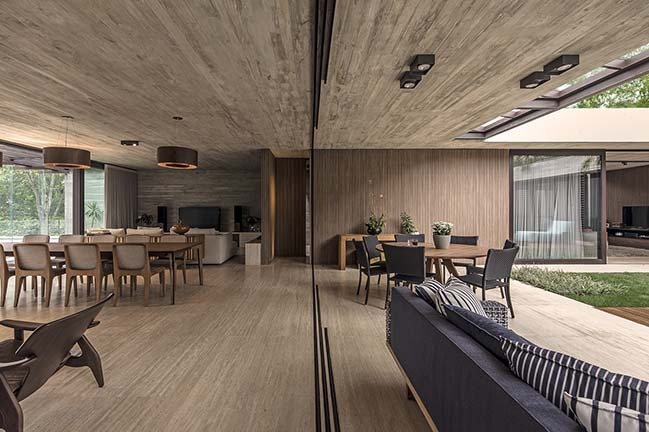 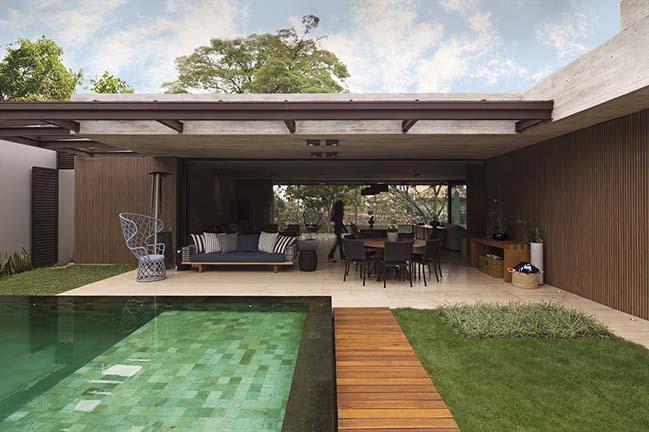 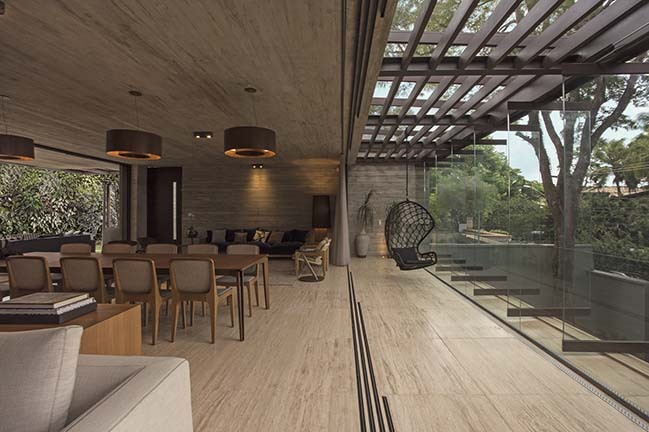 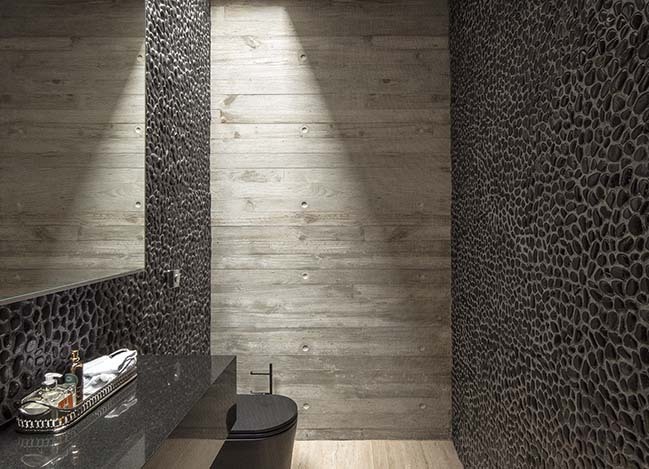 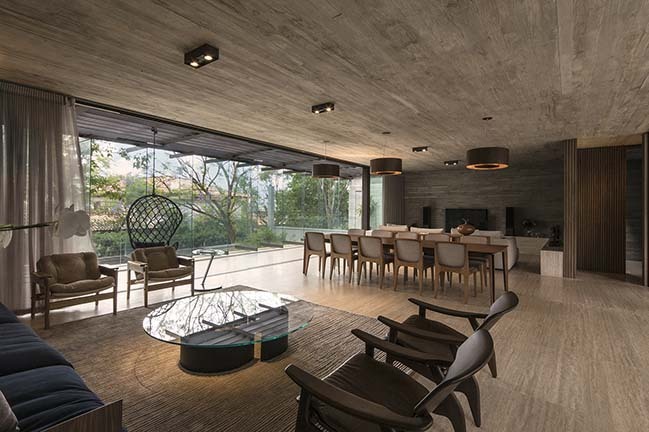 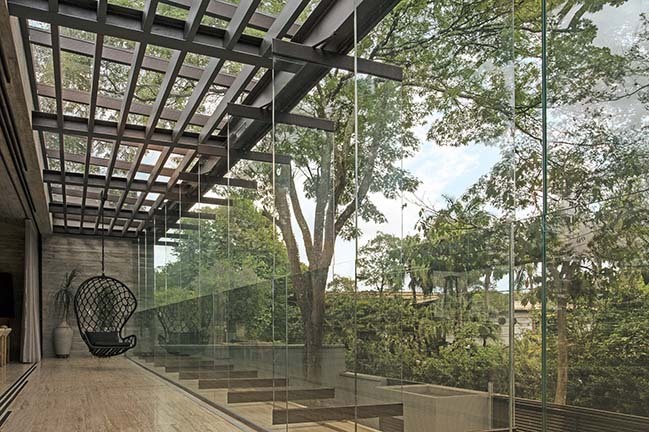 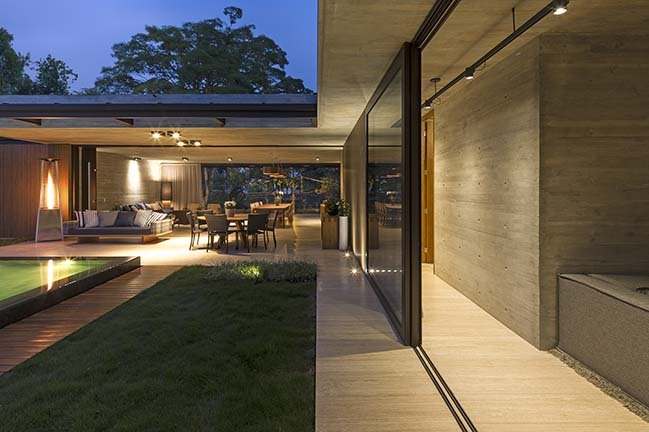 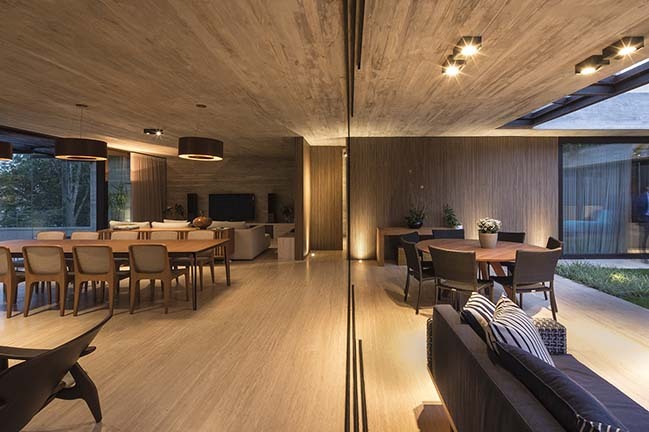 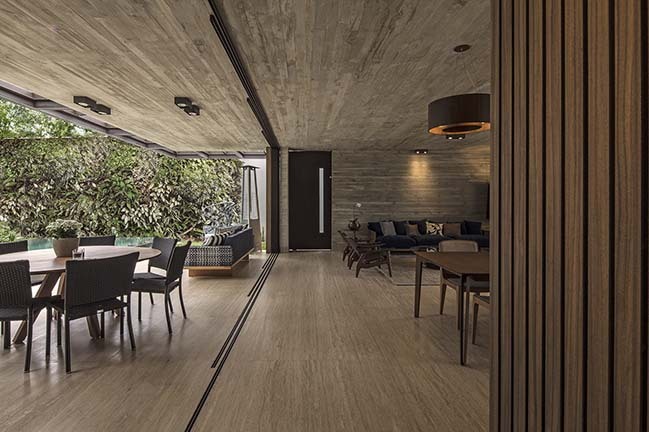 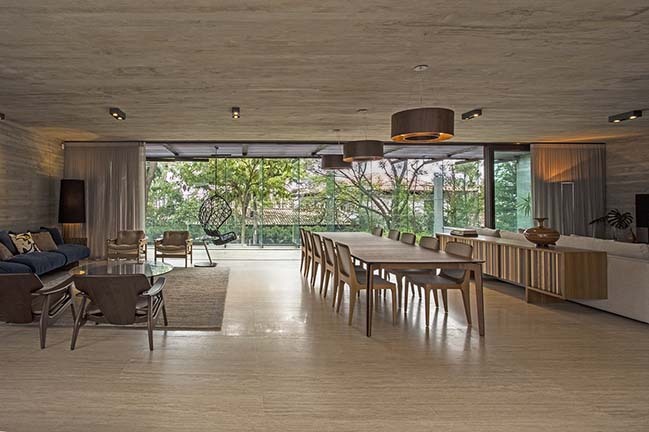 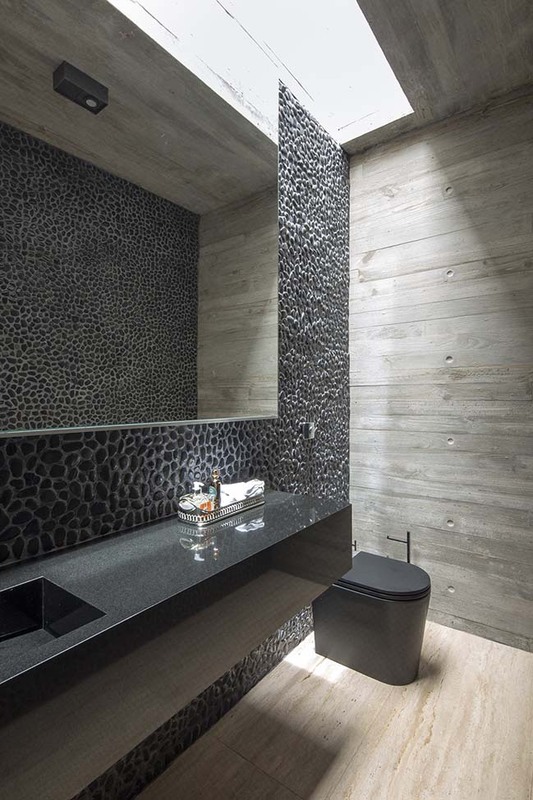 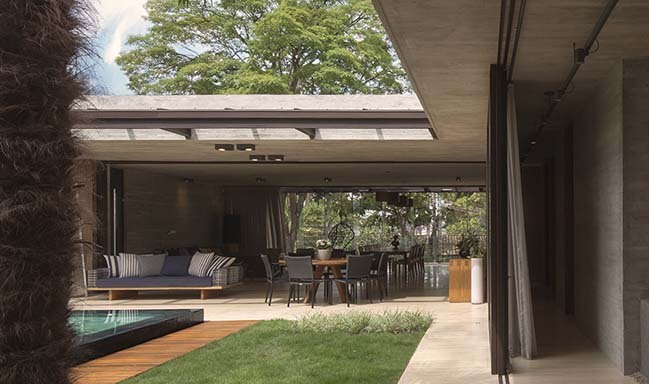 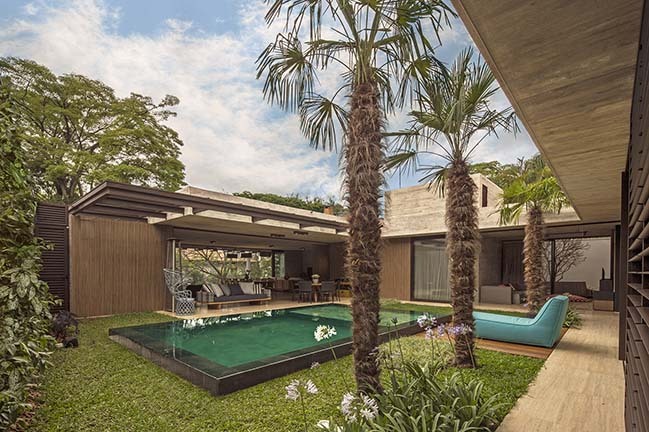 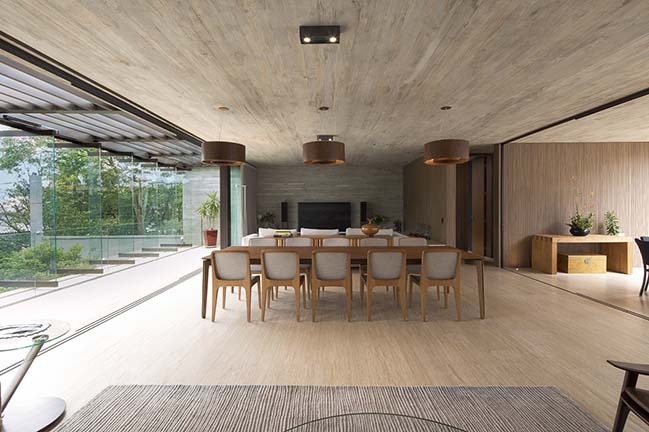 This residence was conceived to promote personal renewal and wellbeing, through spaces where landscape and architecture meet to replenish and invigorate the spirit. 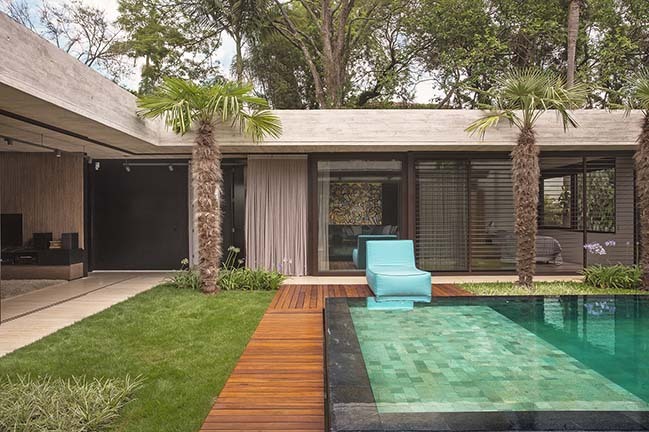 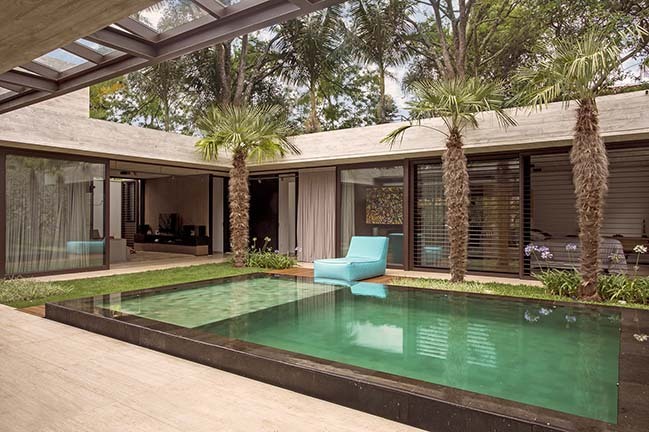 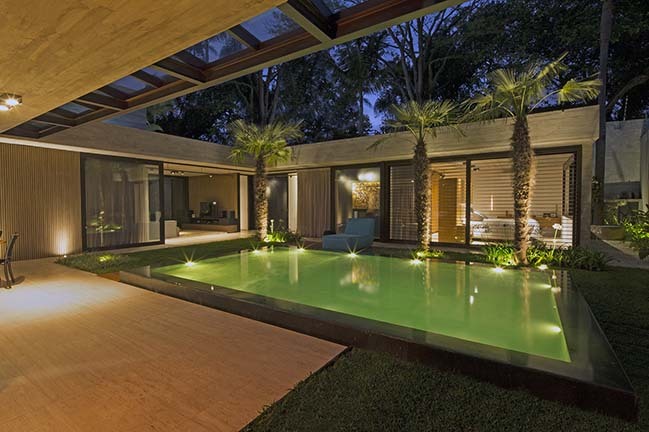 Thus, the central courtyard has a contemplative vertical garden, trees with a small grassy area, and an overflowing swimming pool to promote a sense of water mirror that reflects this garden. 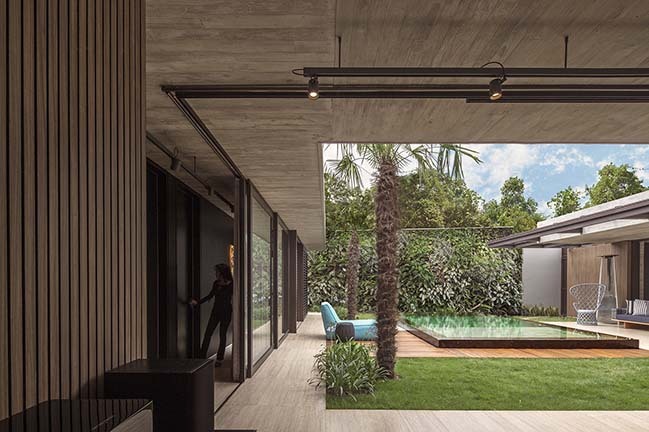 This courtyard, together with the large sliding glass doorways of the two wings, and the twelve pivotal glass doors of the front facade, allow residents to have direct contact with the exterior and its green area. 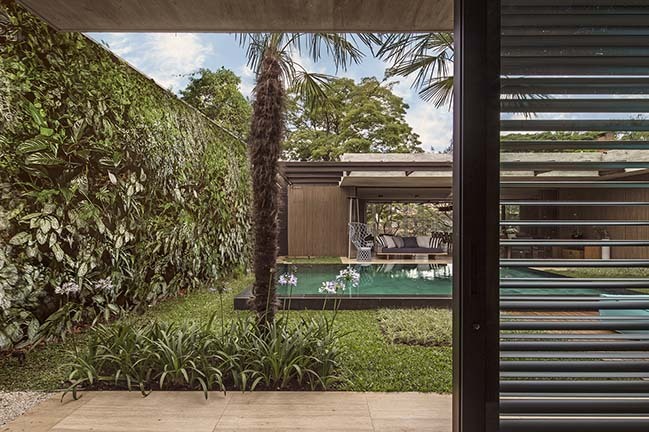 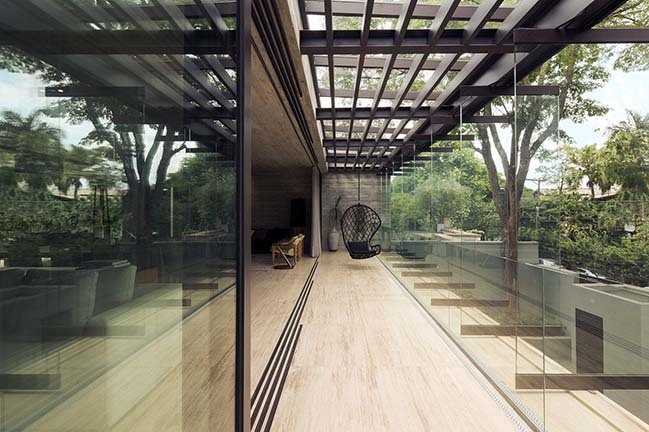 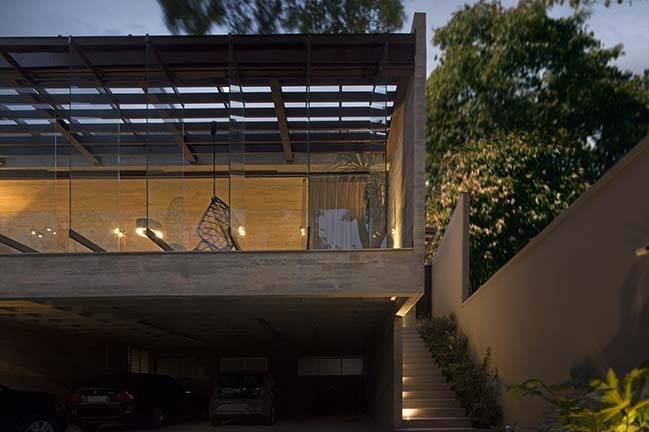 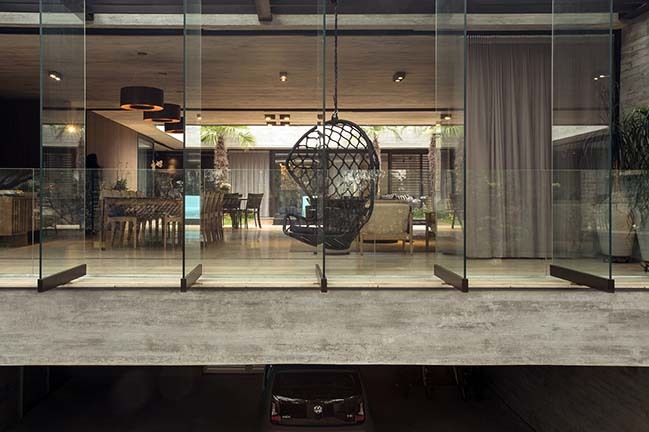 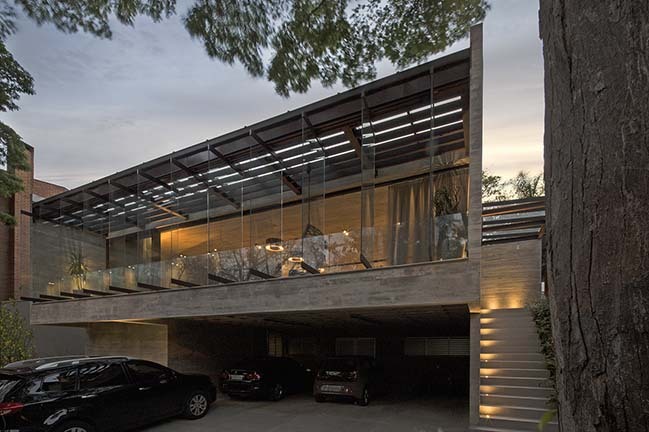 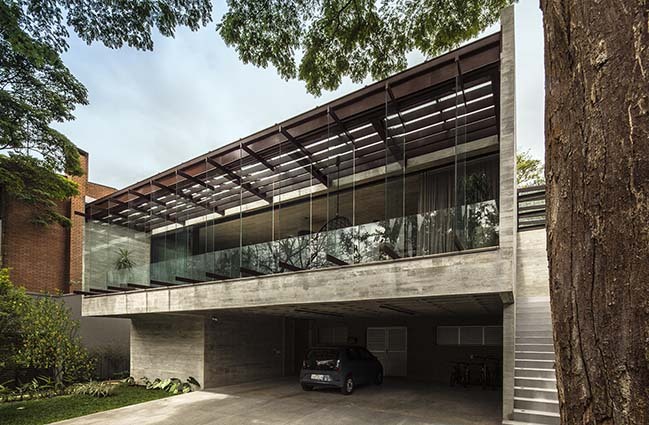 Internally we have sought a dichotomy created by the walls of exposed slatted concrete and the lightness of the frames with large glass panels that open completely towards the vertical garden courtyard and towards the huge existing trees of the street and the environs. 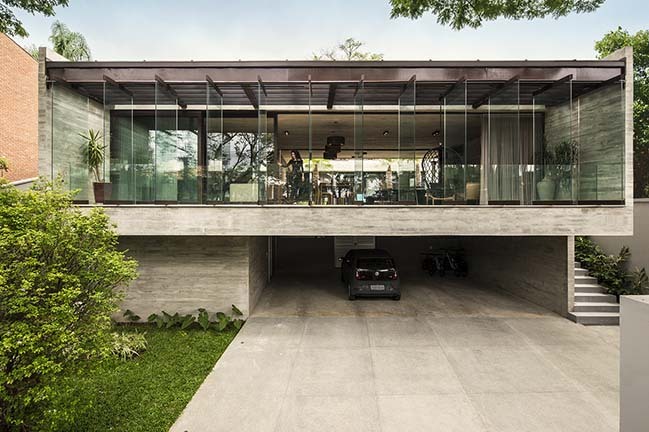 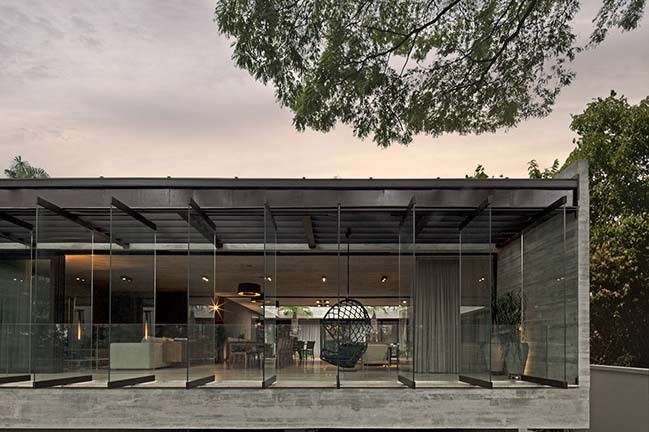 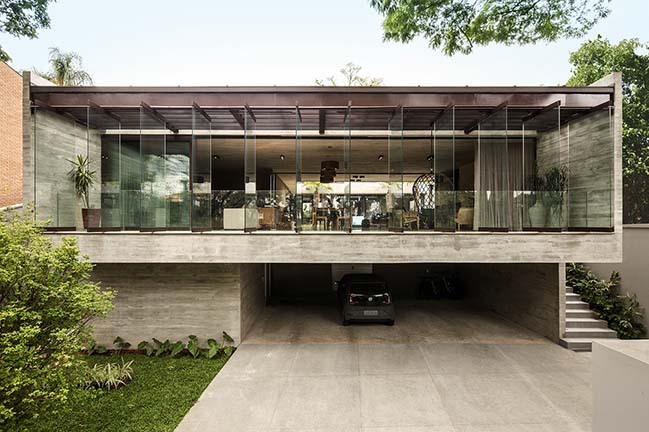 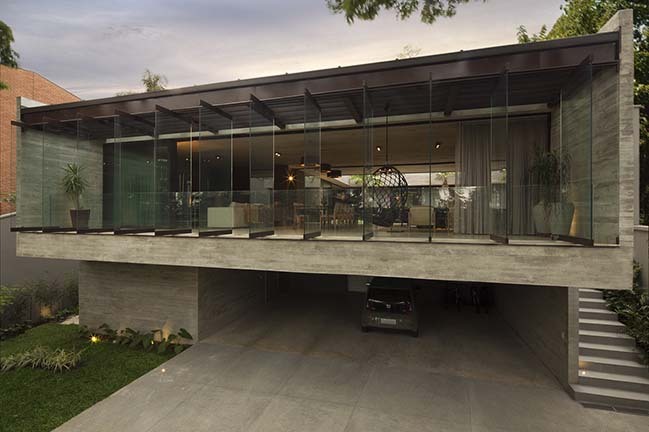 In order to accentuate the light coming from the large front room (east face), a structured set with glass metallic pergola on the roof, and equally transparent glass pivoting doors were designed. 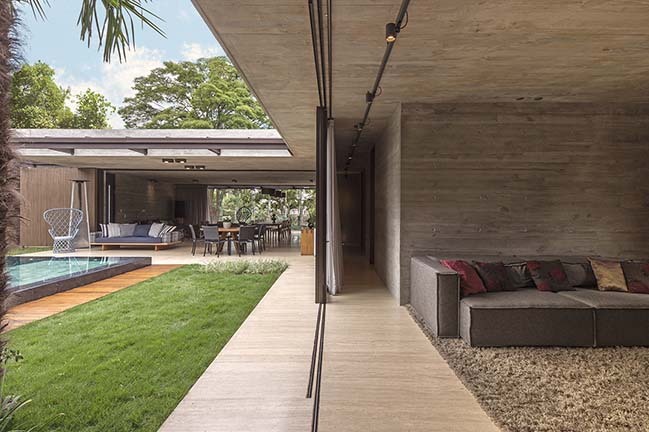 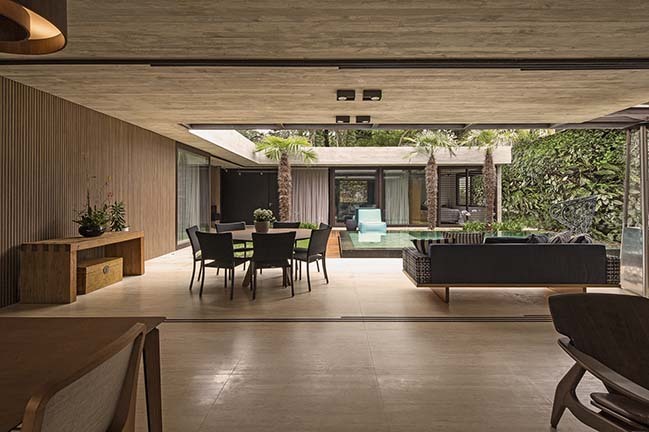 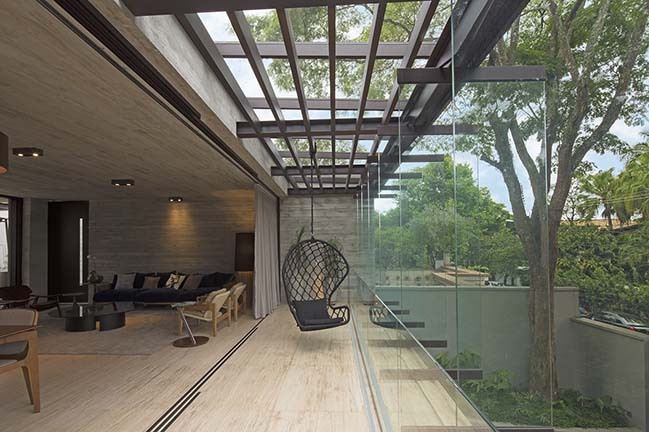 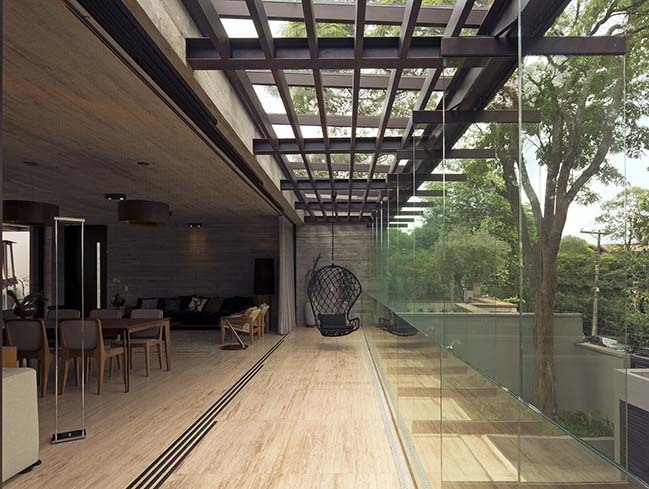 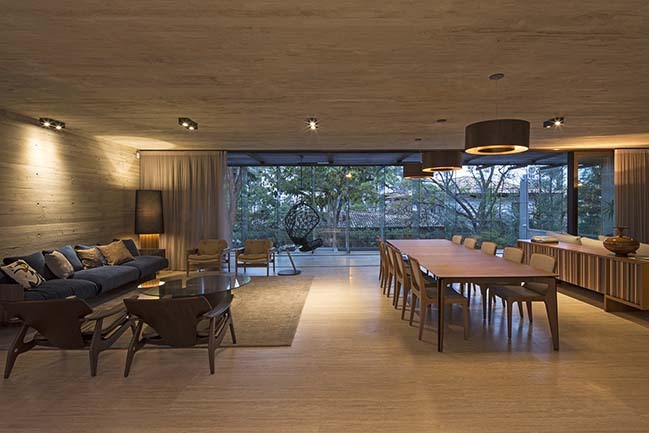 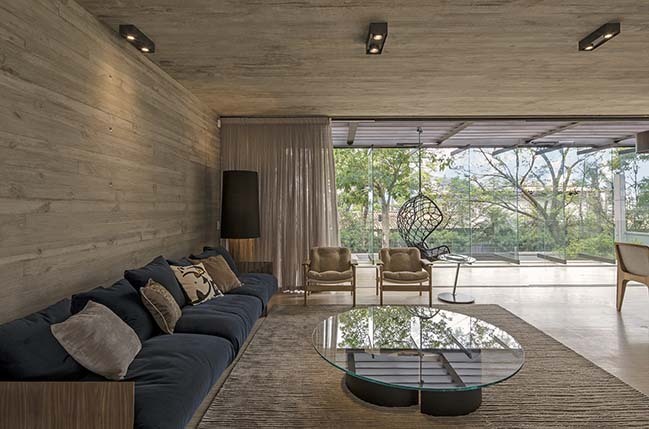 This arrangement has provided an unusual interaction with the treetops, which seem to invade the interior of this large concrete lounge, with no pillars in between. 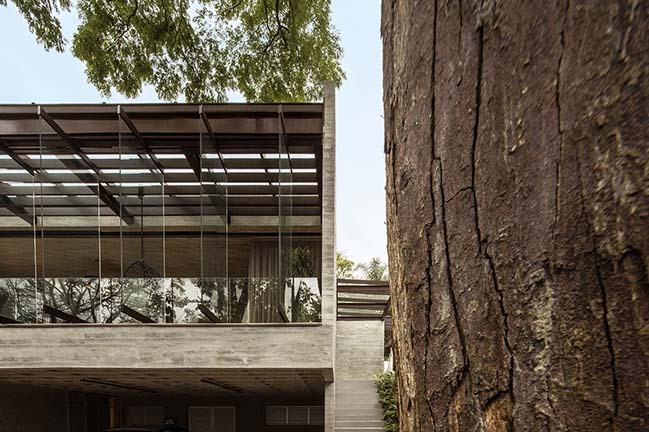 The house could also count on rainwater reuse, solar energy capture, cross ventilation, windows with heat treatment, polystyrene thermal insulation on the roof, digital lighting control, recycled wood, among other measures of green architecture.